Q: Remove the watermark from my flash flip book. I have downloaded a flash book from the internet and find that there is a watermark in each page. I want to remove them by using my PDF to FlashBook. Could you tell me how to make it? our PDF to FlashBook enables you add watermark for you books. At the same time, you can remove it if it is not necessary. Embedding watermark is an effective way of advertising. But on the other hand, it may affect beauty of the e-books. 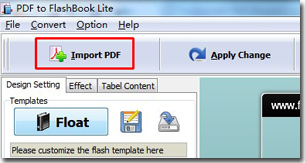 Step1: click “Import PDF’, or choose “Flie”->”Import PDF”, to import your flash flip books. Step2: click the “Set Watermark” button. Step3: check that the “Applying Watermark” option is not chosen. This means you don’t apply watermark into your books. After that, you can click “OK”->”Import Now” to start to import. You will find that there is no any watermark in the flip pages.